Megan recently completed her PhD and was the winner of the 2014 UQ 3MT competition. Her research focuses on how gut health affects chronic diseases, with a particular focus on kidney disease. "As a dietitian, I find it completely frustrating that, despite the incredible research being done, it’s typically the unfounded and potentially dangerous nutrition messages that reach the public. "I believe a communication barrier between scientists and the public is the root cause. "My mission is to help bridge that gap by translating scientific evidence into simple concepts that everyone can understand. "Participating in the Three Minute Thesis competition was a fantastic learning experience that has helped me develop better communication skills," Dr Rossi says. "It was very challenging, but also very fulfilling." Megan says that in a competitive environment it is important to showcase yourself and your research in order to get funding, as well as to broaden your collaboration networks. 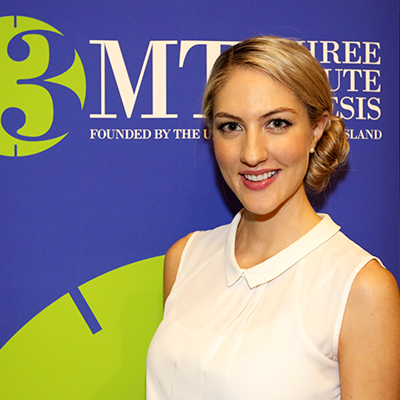 "Participating in 3MT also publicises yourself as a researcher. "At the end of the day we need to gain employment, so promoting and putting ourselves out there is critical. "A lot of great things have stemmed from my participation in 3MT including a number of media interviews and the opportunity to write media articles which I’ve really enjoyed. "New collaborators also heard about our research through 3MT and have expressed interest in working with us in the future." Megan says that her career prospects have improved significantly since winning the competition. "Having 3MT on your CV is priceless. The opportunities that have arisen from competing in 3MT are something that I couldn’t have imagined. "I was lucky enough to be approached by Boeing Australia to do some consultancy work for them after they saw me present my 3MT at UQ. "After the competition funders also approached me to discuss opportunities to help out financially with the second phase study of our research. "I was even able to fulfil my teenage dream of being in Cosmopolitan magazine."